Brahms’s most important contributions to the repertoire of the viola came about as a by-product of his most important contributions to the repertoire of the clarinet. In the same way that the world owes Mozart’s Clarinet Concerto and Quintet to the virtuosity of Anton Stadler, so the creation of Brahms’s last four chamber works was sparked by the artistry of Richard Mühlfeld (1856–1907), the principal clarinettist of the Meiningen Orchestra. Brahms had established a particularly close relationship with this orchestra since their then conductor, Hans von Bülow, had offered him the chance to try out his orchestral works before their official premieres. In March 1891 Brahms visited Meiningen to hear the orchestra under its new conductor Fritz Steinbach, and was struck by the polish and almost feminine sensitivity of Mühlfeld’s playing. He had apparently bidden farewell to composition the previous year with the completion of his G major String Quintet Op 111, but his admiration for the clarinettist’s artistry suddenly re-awakened the creative urge. Having heard Mühlfeld play Weber’s Clarinet Concertino, Brahms asked him to play his entire repertoire for him and asked many questions about his instrument and its technique. Thus fired, he started composing again. Not only do the four works he wrote for Mühlfeld—the Clarinet Quintet and Trio of 1891 and the two Sonatas of 1894—rank among the supreme masterpieces of the instrument’s repertoire, but they represent the purest distillation of Brahms’s thought in the chamber music medium. They also reflect, in their innate expressive character, something of the personal isolation he was beginning to feel as many of his closest friends died off, in an increasingly frequent punctuation of his last years. When sheer beauty is evoked in them, it is as a consolation; nostalgia and melancholy often seem to underlie the most rhythmically assertive ideas. These works, in short, have established themselves as repertoire cornerstones not merely through their magnificent craftsmanship and powers of invention, but because they convey a particularly potent and complex nexus of feeling. The Quintet and Trio, composed at the resort of Bad Ischl in the summer of 1891, received their first performances in Meiningen on 24 November that year, played by Mühlfeld. In the Quintet Joseph Joachim was first violin with members of the Court Orchestra. In the Trio Mühlfeld was joined by Robert Haussmann, the cellist of the Joachim String Quartet, and Brahms himself took the piano part. The Quintet was much the better received of the two, but Brahms several times declared that he personally preferred the Trio. 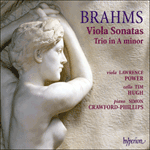 When the Trio came to be published the following year, Brahms provided it with a viola part as an alternative to the clarinet. Such substitutions were not uncommon in the music of the time, though they may seem surprising to us today: performances of the Trio with viola have remained infrequent, and it is almost entirely associated in our minds with the timbre of the clarinet. (Even more surprising, Brahms also made an alternative viola part for the Quintet, turning it into the curious phenomenon of a string quartet with additional viola obbligato.) The viola seems less a natural leader in ensemble chamber music than the clarinet: its darker, huskier timbre does not stand out in such sharp relief from the other string instruments, but it imparts a greater intimacy which renders some passages more atmospheric and subtilizes the play of light and shade that is already part of the expressive essence of these works. The music itself, of course, remains identical in its substance. Standing at the very end of his long line of concerted chamber music, the Trio in A minor, Op 114 embodies all the resource and subtlety of Brahms’s late style. Its extreme compression of thought marks it as a natural successor to his C minor Piano Trio, Op 101, composed in 1886. It is remarkable for the consistency with which it exploits the disturbance, anxiety and shadow of the minor mode, and brief excursions into the major often turn out to offer illusory consolation. Here the cello assumes almost equal importance with the viola, and indeed opens the proceedings unaccompanied, with an eloquent melody varied by the viola and balanced by a muttering triplet motif in the piano. These ideas make up the first subject of a troubled and concentrated sonata-form design. The second subject opens calmly in the relative major (C major) but soon mutates to a more troubled E minor. The terse, uneasy development evolves new thematic entities—a sombre chorale-like phrase, whispering pianissimo semiquaver scales against wide-spread piano chords—and the recapitulation flexibly reshapes the elements of the exposition, bypassing the opening melody to move straight into its more fretful rhythmic continuation. This time the second group starts in F major but veers into the tonic A minor. In the coda the ‘chorale’ idea returns with apparently fateful import, and though the music gains A major it proves curiously insubstantial: the music evanesces into the passionless beauty of an Aeolian harp, with semiquaver scales in liquid contrary motion on viola and cello. A more serenely philosophical mood, tinged with fantasy, prevails in the D major Adagio, which packs much musical matter into a very small space; paradoxically, this masterly compression gives a feeling of expansive relaxation. 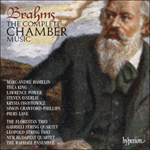 Brahms’s intricate elaboration of the smallest motifs, and the subtle oppositions of instrumental colour, yield textures and thematic working of unusual richness. The ensuing Andantino grazioso in A major is a self-mocking intermezzo, its nonchalant waltz-tune evoking the salon manner of Brahms’s popular Liebeslieder waltzes, but now fluidly and sophisticatedly varied. Perhaps the movement reflects the fact that Brahms had spent time at Bad Ischl that summer in the company of his friend Johann Strauss the Younger, whose waltzes he admired with something close to envy. It evolves three closely related themes, touches D major for a brief trio section, and nonchalantly reduces the initial waltz melody into a schematic version of itself along the way. Bracing and rhythmically supple, the minor-key finale exhibits the most strenuous music in the entire work, in a sonata-form transformation of Brahms’s obsessive scherzo style. The combination of 6/8 and 2/4 metres intensifies the sense of unrest. The development, very concise, is notable for its rapid modulations, involving extended chains or ladders of descending thirds, which suggest mystery and instability even in the movement’s most cheerful passages. The movement drives on towards its conclusion with no relaxation, until the coda’s choleric bravura offers a terse, wintry gesture of dismissal. Les plus importantes contributions de Brahms au répertoire de l’alto dérivèrent de ses plus importantes compositions pour clarinette. Là où la virtuosité d’un Anton Stadler valut au monde le Concerto pour clarinette et le Quintette avec clarinette de Mozart, le talent artistique d’un Richard Mühlfeld (1856–1907), première clarinette de l’orchestre de Meiningen, suscita la création des quatre dernières œuvres de chambre de Brahms. Celui-ci avait établi une relation particulièrement étroite avec les musiciens de Meiningen depuis que Hans von Bülow, alors à leur tête, lui avait permis d’essayer ses œuvres orchestrales avant leur première officielle. En mars 1891, Brahms se rendit à Meiningen pour entendre l’orchestre sous la baguette de son nouveau chef, Fritz Steinbach: là, il fut frappé par le jeu de Mühlfeld, raffiné, d’une sensibilité quasi féminine. L’année précédente, il avait, semble-t-il, fait ses adieux à la composition en achevant son Quintette à cordes en sol majeur, op. 111, mais son admiration pour l’art du clarinettiste raviva soudain sa pulsion créatrice. Ayant entendu Mühlfeld interpréter le Concertino pour clarinette de Weber, Brahms lui demanda de jouer tout son répertoire et l’interrogea beaucoup sur son instrument et sur sa technique. Ainsi enflammé, il se remit à composer. Non contentes de figurer parmi les chefs-d’œuvre suprêmes du répertoire pour clarinette, les quatre pièces (le Quintette avec clarinette et le Trio de 1891, plus les deux Sonates de 1894) adressées à Mühlfeld incarnent la plus pure distillation de la pensée de Brahms appliquée à la musique de chambre, tout en reflétant, dans leur caractère expressif inné, un peu de l’isolement éprouvé par le compositeur à la mort de plusieurs amis proches—des morts qui ponctuèrent de plus en plus souvent l’automne de sa vie. Quand ces œuvres évoquent la beauté absolue, c’est en guise de consolation, la nostalgie et la mélancolie semblant sous-tendre la plupart des idées rythmiquement assurées. Bref, ces pages sont devenues des pierres angulaires du répertoire par leur magnifique maîtrise, par leur pouvoir inventif, mais aussi par le lien émotionnel particulièrement puissant et complexe qu’elles véhiculent. Composés à la station de Bad Ischl à l’été de 1891, le Quintette et le Trio furent créés à Meiningen le 24 novembre de la même année, avec Mühlfeld à la clarinette, plus Joseph Joachim (premier violon) et des membres de l’orchestre de la cour pour le Quintette. Pour le Trio, Mühlfeld fut rejoint par Robert Haussmann, le violoncelliste du Quatuor Joachim, et par Brahms lui-même, au piano. Ce Trio fut nettement moins bien reçu que le Quintette, mais Brahms déclara à plusieurs reprises qu’il avait sa préférence. Lorsqu’il parut l’année suivante, ce fut avec une partie d’alto en guise d’alternative à la clarinette. De telles substitutions étaient courantes à l’époque, même si elles peuvent nous surprendre aujourd’hui: les exécutions du Trio avec alto sont restées rares, et l’œuvre demeure presque toujours associée, dans nos esprits, au timbre de la clarinette. (Plus surprenant encore, Brahms fit également une partie d’alto alternative pour le Quintette, qui devint alors ce curieux phénomène: un quatour à cordes avec alto obbligato.) Dans la musique de chambre, l’alto apparaît comme un chef moins naturel que la clarinette: son timbre plus sombre, plus rauque ne tranche pas autant sur les autres instruments à cordes, même s’il insuffle un surcroît d’intimité, et donc d’atmosphère, à certains passages, sublimant le jeu d’ombre et de lumière déjà inhérent à l’essence expressive de ces œuvres. La substance même de la musique est, bien sûr, inchangée. Survenant à la toute fin d’une longue liste d’œuvres de chambre concertantes, le Trio en la mineur, op. 114 incarne toute la ressource, toute la subtilité du style brahmsien tardif, avec une extrême compression d’idées qui en fait le successeur naturel du Trio avec piano en ut mineur, op. 101, composé en 1886. Il vaut par la constance avec laquelle il exploite le trouble, l’anxiété et l’ombre du mode mineur, les brèves incursions dans le mode majeur n’offrant souvent qu’une consolation illusoire. Ici, le violoncelle est presque aussi important que l’alto et c’est sans accompagnement qu’il ouvre l’œuvre avec une éloquente mélodie variée par l’alto et contreblancée par un marmottant motif en triolets, au piano. Ces idées constituent le premier sujet d’un schéma de forme sonate agité et concentré. Le second sujet commence paisiblement dans le majeur relatif (ut majeur) mais mute bientôt en un mi mineur plus inquiet. Le développement concis, ardu déploie de nouvelles entités thématiques—une sombre phrase de type choral, qui murmure des gammes en doubles croches pianissimo contre d’amples accords pianistiques—et la réexposition refaçonne en souplesse les éléments de l’exposition, éludant la mélodie initiale pour passer directement à sa continuation rythmique plus maussade. Cette fois, le second groupe commence en fa majeur mais vire pour atteindre le la mineur de tonique. Dans la coda, l’idée de «choral» revient avec une teneur apparemment funeste, et la musique a beau gagner la majeur, elle est curieusement sans substance, s’évanouissant dans la beauté sans passion d’une harpe éolienne, avec des gammes en doubles croches présentées en un liquide mouvement contraire, à l’alto et au violoncelle. Un climat plus sereinement philosophique, empreint de fantaisie, prévaut dans l’Adagio en ré majeur, qui concentre beaucoup de matière musicale dans un minuscule espace—une magistrale compression qui, paradoxalement, procure un sentiment de détente expansive. La complexe élaboration des moindres motifs et les subtiles contrastes de la couleur instrumentale produisent des textures et un travail thématique d’une exceptionnelle richesse. L’Andantino grazioso qui suit, en la majeur, est un intermezzo en proie à l’autodérision, son nonchalant air de valse évoquant l’atmosphère de salon des populaires Liebesliederwalzer brahmsiennes, mais variées avec fluidité et sophistication. Peut-être faut-il y voir un reflet du séjour que Brahms fit à Bad Ischl cet été-là, en compagnie de son ami Johann Strauss fils, dont il admirait, voire enviait, les valses. Trois thèmes étroitement connexes sont développés dans ce mouvement, qui effleure ré majeur le temps d’une brève section en trio et réduit nonchalamment la mélodie de valse initiale à une variante schématique d’elle-même. Vivifiant et rythmiquement souple, le finale en mineur exhibe la musique la plus énergique de tout le Trio, avec une transformation (de forme sonate) de l’obsédant style de scherzo brahmsien. La combinaison de mètres à 6/8 et à 2/4 renforce le sentiment d’agitation. Le développement, fort concis, vaut par ses modulations rapides, dans lesquelles de longues chaînes ou échelles de tierces descendantes suggèrent le mystère et l’instabilité, même dans les passages les plus gais. Le finale poursuit vers la conclusion sans dételer, jusqu’à ce que la bravoure colérique de la coda offre un geste de renvoi laconique, glacial. Brahms’ bedeutendste Beiträge zum Violarepertoire waren ein Nebenprodukt seiner bedeutendsten Beiträge zum Klarinettenrepertoire. Wie die Welt Mozarts Klarinettenkonzert und -quintett der Virtuosität Anton Stadlers verdankt, so wurde die Kreation der letzten vier Kammermusikwerke von Brahms durch die Kunst von Richard Mühlfeld (1856–1907), dem ersten Klarinettisten des Meininger Orchesters, angeregt. Brahms hatte eine besonders enge Verbindung mit diesem Orchester, da Hans von Bülow, als er dort Dirigent war, ihm angeboten hatte, seine Orchesterwerke vor ihrer offiziellen Uraufführung auszuprobieren. Im März 1891 besuchte Brahms Meiningen, um sich das Orchester unter seinem neuen Dirigenten Fritz Steinbach anzuhören und war von der Glätte und nahezu femininen Sensibilität von Mühlfelds Spiel beeindruckt. Mit der Komposition des G-Dur-Streichquintetts, op. 111, im Vorjahr hatte er geglaubt, vom Komponieren Abschied zu nehmen, aber seine Bewunderung für die Kunst dieses Klarinettisten weckte seinen kreativen Drang erneut. Nachdem er Mühlfeld in Webers Klarinetten-Concertino hörte, bat ihn Brahms, ihm sein gesamtes Repertoire vorzuspielen, und stellte ihm viele Fragen über das Instrument und seine Technik. So angefeuert, begann er wieder zu komponieren. Die vier Werke, die er für Mühlfeld schrieb—das Klarinettenquintett und -trio von 1891 und die beiden Sonaten von 1894—gehören nicht nur zu den überragendsten Meisterwerken im Repertoire für das Instrument, sondern repräsentieren auch die reinste Destillation von Brahms’ Denken im Bereich der Kammermusik. In dem ihnen eigenen expressiven Charakter reflektieren sie außerdem ein wenig die private Isolation, die er zu fühlen begann, als nach und nach viele seiner engsten Freunde in immer kürzeren Intervallen starben. Wenn in ihnen pure Schönheit erweckt wird, so als Trost; Nostalgie und Melancholie durchziehen oft sogar die rhythmisch selbstbewusstesten Ideen. Diese Werke haben sich nicht nur wegen ihres überragenden handwerklichen Geschicks und ihrer Erfindungskraft, sondern auch wegen der besonders wirksamen und komplexen Verknüpfung der Emotionen als Marksteine im Repertoire etabliert. Das Quintett und Trio, die im Sommer 1891 im Kurort Bad Ischl komponiert wurden, wurden von Mühlfeld im gleichen Jahr am 24. November in Meiningen uraufgeführt. Joseph Joachim spielte erste Violine im Quintett mit Mitgliedern des Hoforchesters. Im Trio musizierte Mühlfeld mit Robert Haussmann, dem Cellisten des Joachim-Quartetts mit Brahms selbst am Klavier. Das Quintett erfuhr eine wesentliche bessere Aufnahme, aber Brahms selbst erklärte mehrmals, dass er persönlich das Trio bevorzugte. Als das Trio im folgenden Jahr veröffentlicht wurde, lieferte Brahms auch eine alternative Bratschenstimme an Stelle der Klarinette. Obwohl wir sie heute überraschend finden, waren solche Ersetzungen in Musik der Zeit nicht ungewöhnlich. Aufführungen des Trios mit Viola sind nach wie vor selten, und in unserer Vorstellung assoziieren wir es praktisch immer mit dem Klang der Klarinette. (Noch überraschender ist es, dass Brahms auch eine alternative Bratschenstimme für das Quintett lieferte, was das Werk in das seltsame Phänomen eines Streichquartetts mit obbligater Viola verwandelte.) Die Viola erscheint weniger als natürliche Führungskraft in Kammermusik als die Klarinette: ihr dunkleres, verhalteneres Timbre hebt sich nicht so deutlich von den anderen Streichinstrumenten ab, aber sie vermittelt größere Intimität, die einige Passagen atmosphärischer und das Spiel von Licht und Schatten, das ohnehin schon zum expressiven Wesen des Werks gehört, noch subtiler macht. Die Musik selbst bleibt natürlich im Wesentlichen gleich. Das Trio in a-Moll, op. 114 steht am Ende seiner langen Reihe konzertanter Kammermusik und verkörpert all die Ressourcen und Raffinesse von Brahms’ spätem Stil. Seine extreme Komprimierung der Ideen markiert es als natürlichen Nachfolger des c-Moll-Klaviertrios, op. 101, das 1886 komponiert wurde. Es ist denkwürdig für die Konsequenz, mit der es Unruhe, Angst und Dunkel der Molltonart ausnutzt, und kurze Ausflüge nach Dur erweisen sich oft als illusorischer Trost. Das Cello nimmt hier fast die gleiche Bedeutung an wie die Bratsche und beginnt das Werk ohne Begleitung mit einer eloquenten Melodie, die von der Viola variiert und von einem murmelnden Triolenmotiv im Klavier ausgeglichen wird. Diese Ideen ergeben das erste Thema einer verstörten, konzentrierten Sonatenform. Das zweite Thema beginnt ruhig in der relativen Durtonart (C-Dur), mutiert aber bald zu einem aufgewühlteren e-Moll. Die knappe, unruhige Durchführung bildet neue thematische Einheiten—eine feierlich-choralhafte Phrase, pianissimo geflüsterte gegen weit gespannte Klavierakkorde gesetzte Sechzehntelskalen—und die Reprise gestaltet die Elemente der Exposition flexibel um, wobei sie die einleitende Melodie vermeidet und direkt in ihre nervösere Fortsetzung einsteigt. Diesmal beginnt die zweite Gruppe in F-Dur, gleitet aber in die Tonika a-Moll ab. In der Coda kehrt die „Choral“-Idee mit scheinbar verhängnisvoller Tragweite wieder, und obwohl die Musik A-Dur wieder erreicht, so erweist sich dies als merkwürdig unbedeutend: die Musik schwindet in die leidenschaftslose Schönheit einer äolischen Harfe mit Sechzehntelskalen in fließender Gegenbewegung in Brasche und Cello. Im D-Dur-Adagio herrscht eine von Phantasie angehauchte heiterere, philosophischere Stimmung vor, und viel musikalisches Material wird in sehr wenig Raum gezwängt. Diese meisterliche Komprimierung vermittelt jedoch paradoxerweise ein Gefühl expansiver Entspannung. Brahms’ intrikate Ausarbeitung selbst der kleinsten Motive und die feinfühlige Gegenüberstellung verschiedener Instrumentenfarben bringen ungewöhnlich reichhaltige Gewebe und thematische Verarbeitung hervor. Das folgende Andantino grazioso in A-Dur ist ein Intermezzo, das sich selbst verspottet, und seine nonchalante Walzerweise evoziert die Salonmanier von Brahms’ populären Liebesliederwalzern, hier aber flüssig und kultiviert variiert. Der Satz reflektiert vielleicht die Tatsache, dass Brahms in diesem Sommer einige Zeit in der Gesellschaft seines Freundes Johann Strauss Sohn in Bad Ischl verbracht hatte, dessen Walzer er fast neidisch bewunderte. Es entwickelt drei eng verwandte Themen, führt für den Trioteil kurz nach D-Dur und reduziert nebenbei die anfängliche Walzermelodie lässig auf eine schematische Version ihrer selbst. Das erfrischende und rhythmisch flexible Moll-Finale stellt in einer sonatenförmigen Transformation von Brahms’ obsessivem Scherzostil die anspruchsvollste Musik des gesamten Werkes zur Schau. Die Kombination von 6/8- und 2/4-Takt intensiviert das Gefühl der Unruhe. Die Durchführung ist äußerst kurz und bündig und für ihre rapiden Modulationen mit ausgedehnten Ketten oder Leitern absteigender Terzen bemerkenswert, die selbst in den muntersten Passagen des Werkes Geheimnistuerei und Instabilität andeuten. Der Satz jagt unermüdlich auf seinen Schluss zu bis die cholerische Bravour der Coda eine knappe, frostige Abschiedsgeste bietet.